With a unique trapezoid design, the Agility Trainer Pro does things other agility trainers can’t: lets you train for quickness, power and speed with true, game-like movements. Sports don’t happen in a straight line, now neither does your training. The Agility Trainer Pro lets you recreate the curvilinear and broken patterns that take place in sports, helping you dial in your cuts, turns and changes of direction. It lets you add the multi-directional quickness and precise footwork that can quickly change the game. Durable and built to work on any surface, including hardwood, turf and grass, the Agility Trainer Pro won’t slip, slide or otherwise interrupt your training sessions. 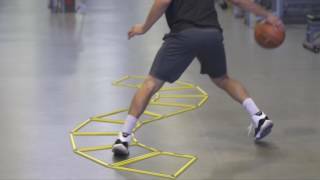 It’s the must-have agility trainer for any athlete who’s serious about their footwork.